These are the most common question I've received. Hopefully if you have similar issues this can be very useful. Q: What is this app? 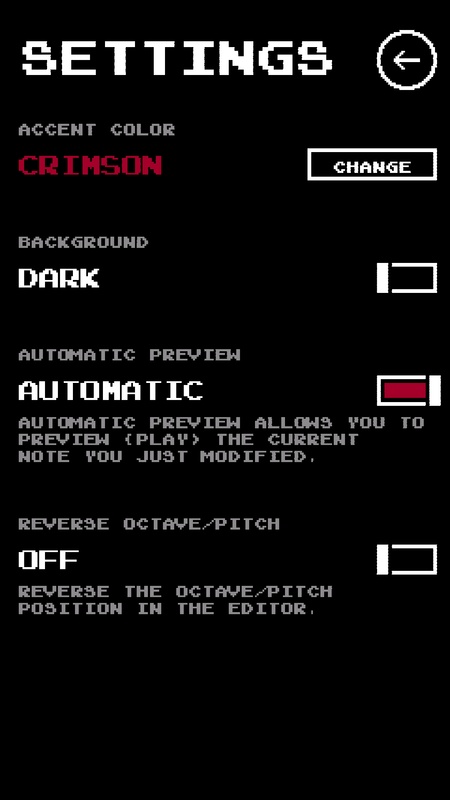 A: 8Tones is a tiny 8-bit music (chiptune) just-for-fun creation app. 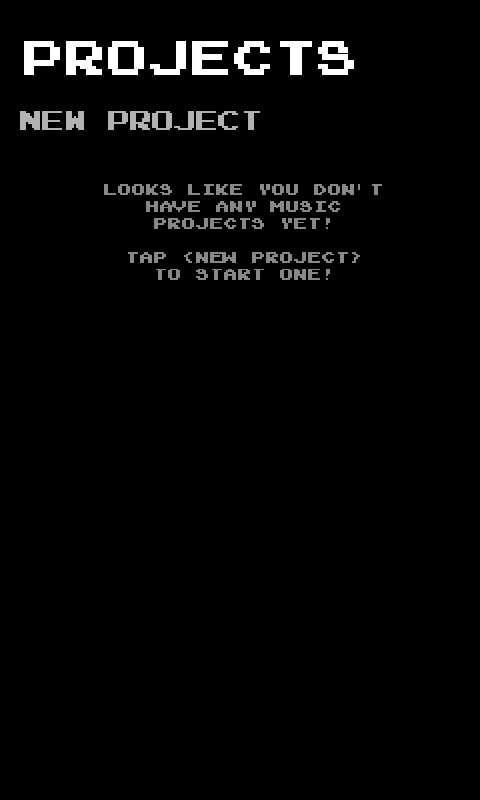 If you know how to use Famitracker (an emulated NES console grade music maker) then this app could be very easy to learn. Q: I am confused. How do I use this app? A: Don't worry, this is a guide how to operate 8Tones like a pro! Q: What programming language/engine did you use? 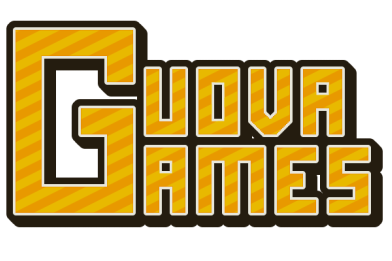 A: I used Game Maker: Studio and this engine has its own coding language called GML. Q: What OS does it support? Q: How do I navigate back? A: Press the ← (back) button or a back circle (depends on your mobile platform) to do it. Q: Why is there no audio? A: Make sure your device is not set to mute. And if you are using an iOS device, make sure the mute toggle switch is NOT set to vibrate only/mute. Q: Can I create wav/mp3/ogg/nsf? A: Due to its foundation software/engine limitations, this app cannot straight-up create any audio file formats like wav/mp3/ogg/nsf. 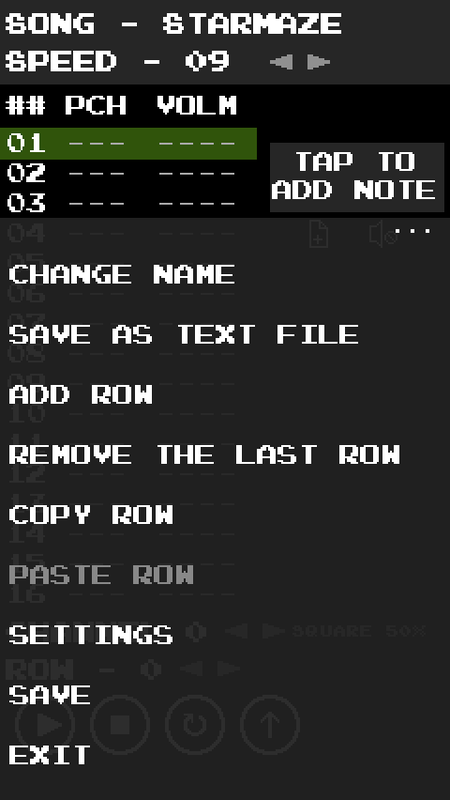 However on the Android and iOS version you can now export as a text file (saved in the phone storage Documents folder) that's importable via a software called Famitracker. Famitracker has the capabilities to import raw text files and export as NSF or wav (you can easily convert it into mp3) files. For Android, Click here to check out a guide how to do this. For iOS, click here. A: NSF (NES Sound Format) is an audio file format designated on NES (Nintendo Entertainment System) console. 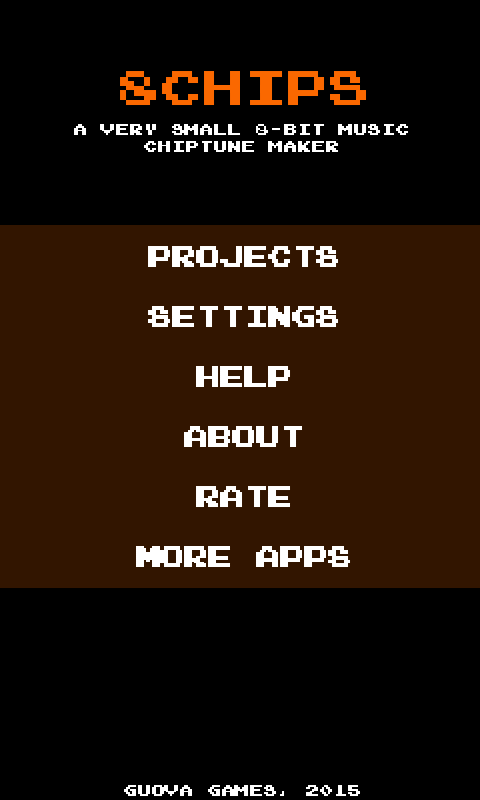 If you do plan to make a homebrew NES game or NES game hack this could be quite helpful. Q: How I can record my creation if my platform doesn't support text export? A: If you wanted to record your creation, simply use an aux cable (if your computer has aux input port) or aux to mic cable (on computer that don't have aux input but had mic input). Then use that to record audios using programs such as Audacity®. 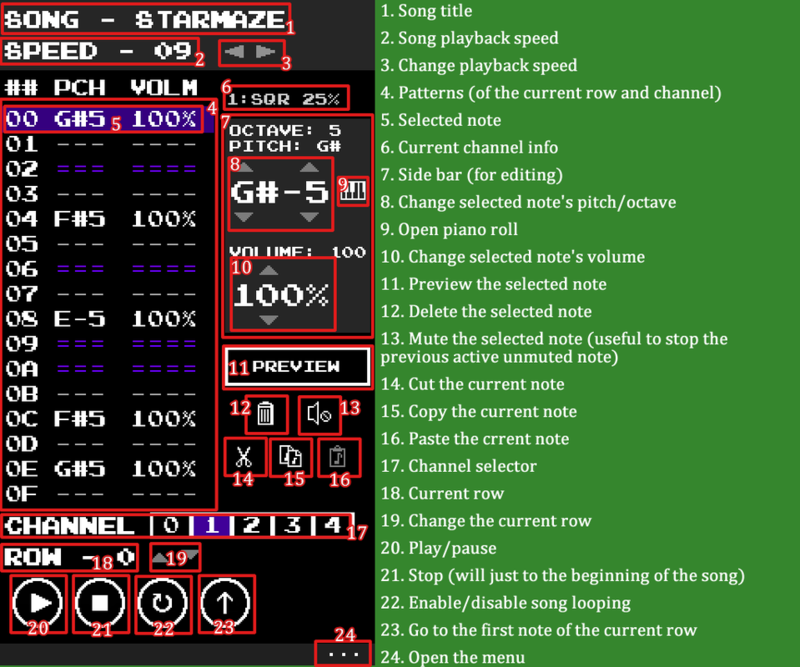 OR if you know how to use Famitracker then you can simply copy your work manually to there. Q: Can you add Facebook/Twitter/Tumblr/other social media support? What about DropBox/GoogleDrive/OneDrive? A: I really wish I could but there's no way to implement these functions as for right now from the engine I built from. Q: Why the touch is not working on my Windows Mobile/Phone device? A: Sometimes it may happens since the engine I'm using has touch problems on certain models of Windows Phones. If this happens, try to reinstall the app is my advise (but it's not guaranteed solution). Q: The note keeps on playing! What should I do? A: It's simple, add a muted note will stop the previous note! If you have any other questions please contact me or leave a comment below this page. Upon starting your app, this is where will you be. Settings - Change your settings of course! More Apps - More apps by me! Automatic preview - If this option has turn on. Every time you made a changes to a note, 8Tones will play the modified note automatically for about half a second so you know what it sounds like. If it's turned off, adding/modifying notes will be not be played unless you play the song or pressing the "Preview" button. To open a menu there should be a triple dot on the bottom right corner of the screen, tap it to open it. Save as text file - This will export your current project as a text file. With this text file you can import it via Famitracker. Add row - Your song is not long enough? This will add another row (after the last row of the song) to let you add more length of your music. Remove the last row - Quite obvious, this remove the last row of the current song project. Copy row - Copies this current row of this channel. There are 16 notes on every single row and 5 channels (channel 0 - square wave 50%, channel 1 - square wave 25%, channel 2 - square wave 12.5%, channel 3 - triangle wave, channel 4 - noise/beats/samples). You can navigate the song by selecting a note in the columns and/or clicking arrows next to Channel and Row. 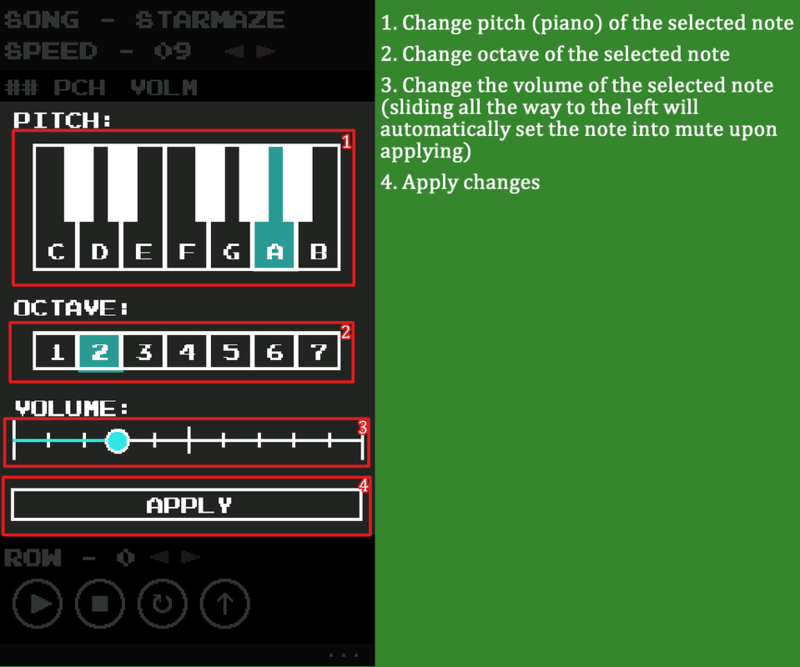 As for notes: "- - -" means blank note; "= = =" means muted note; anything else ("C # 4" as an example) are active notes. To unmute a note, select the mute note and unmute the note (select the speaker icon) just like how you add a note. You can also delete a mute note with ease. To change tempo (playback speed) there's two arrows next to the song's speed (1 - slowest, 8 - default speed, 12 - fastest). Depends on your platform, you can cut/copy/paste notes between channels. However you cannot cut/copy/paste notes between beats channel (channel 4) to and from other channels. REMEMBER to save your project! Loop button - If loop is enabled, it will continue playing the song from start once the song ends. On your current project, select "Save as text file". A prompt will show you that the file has been exported! Connect your Android device to your Windows PC, go to your phone > Phone/Internal Storage (NOT YOUR EXTERNAL SD CARD) > Documents and you will find the exported text file of your project. Copy that file to your computer (anywhere you want in your personal folder). Once you're on Famitracker, go to File > Import text... to locate your exported project and then import it. Once imported, go to Module > Module Properties (Ctrl + P). Then in the Module Properties windows, make sure the project's "Expansion sound" is set to "Nintendo MMC5" and then hit "Ok". Feel free to modify your project if you want! When you're ready to export, go to File > Create NSF... or Create WAV... and Fmaitracker will begin to create NSF/WAV. After you're done, enjoy your work! You can convert the WAV file to an MP3 file via Audacity. As for NSF files, there's plenty of software you can find on Google that plays such audio format. Connect your iPhone/iPod Touch to PC and iTunes will automatically pops up (if you have iTunes installed). On iTunes, go to your iPhone/iPod Touch > Settings (on the left sidebar) > Apps. Scroll down to File Sharing section and select "8Tones". Select the text file(s) you exported (hold ctrl to select multiple files) and click "Save to...". Save the file(s) to your computer (anywhere you want in your personal folder). NOTICE: Please DO NOT modify/delete the file "SYSTEM.gv". If you do it may cause the app to malfunction.